It’s time to rev up for Brum as Britain’s biggest bike show descends on the NEC. The doors will be flung open Saturday 22nd November on Motorcycle Live, a nine day biking bonanza which pretty much has it all. This is the show to go to check out the very latest models, the weird and wonderful one-offs, and hang with some of the biggest names in biking. Your reasonably priced ticket will also earn you entry to the fuel-fumed live action arena. In fact, with so much on offer just what should you make sure you don’t miss…? Destiny Cycles will be celebrating their 15th birthday in suitable style by unveiling a radical re-working of the mighty Swedish style chop which first set the Yorkshire customisers on the road to international glory. Known only as “Vic’s crazy Triumph” the original fat-assed bike caught the appreciative eye of many a punter and judge, securing Best in Show at the 200 Rock & Blues Custom Show. That award, coupled with countless build requests sparked the creation of Destiny, clearly one of the UK’s most ingenious and creative custom shops. Making its global show debut the new bike retains only the engine and transmission from the original build, – and even then these have been radically reworked – and will, says Vic “be a very different shape to the huge rear wheeled original. Catch it on the Carole Nash stand, Hall 3, 3C30. The NEC has traditionally provided UK bikers with their first sight of forthcoming models as the leading manufacturers jostle for position in advance of the next biking season. So what is it that’s got you salivating in anticipation? Kawasaki’s much anticipated, Formula One inspired, supercharged Ninja H2 is surely high on many Christmas lists. Based on the H2R track bike and near as dammit owning the same 998cc engine, albeit tweaked for road legality, the new machine kicks out a mighty 210bhp. It is say Kawasaki, “shaped for speed” and make no mistake, this bike is going to fly. It certainly looks the part in this promo vid. So, worth £25,000 of your British pounds? Allen Millyard, the genius/maniac who once created a 500bhp V10 using a Dodge Viper engine, is back and, as ever not doing things by halves. This time he’s bringing the Flying Millyard, which, as the name suggests has aeronautical connections in the form of its two-cylinder Pratt & Whitney area-engine. The all hand-built, five litre V-twin board track racer pulls up on the Carole Nash stand fresh from gaining both Best in Class and Most OTT Vehicle at top posh persons auto fest, Salon Privé. Well over 270,000 views on YouTube of just the first testing of the P&W engine suggest appetite among bikers for sight of this mighty new machine will be stronger than an I’m A Celebrity winner’s stomach. Allen will also pay a personal visit to the Carole Nash stand at 11.30 am on Monday 24th November for a Q&A. The Custom Extreme zone is aptly named, featuring metal more twisted than a Curly Wurly playing, er, Twister. Hosted by the bad boys and girls at Back Street Heroes mag, the zone will feature Lincolnshire chopmeister Shaun Barley’s State Trooper, Ian Cushing’s long ‘n’ lithe Rousler and much more metal madness. Drop by Hall 4 and you can also claim a free BSH tee shirt. It’s snap judgement time as the inaugural MotoFoto contest comes to a climax. Organised by Carole Nash in conjunction with MCN, the competition attracted no fewer than 1,800 entries which an expert panel whittled down to just 100 with a further 20 put through to the final public vote by visitors to the insidebikes Facebook page. With the votes counted the top 12 photographs have been selected by you, the Great British Biking Public, to feature in the Carole Nash 2015 calendar. This will, as ever, be available free from the company’s stand which will also play host to the winners’ presentation. Carole Nash brand ambassadors Jonathan Rea and Leon Haslam will handle the ceremonials from 1pm on Saturday 22nd November, handing out cash and cameras to the top three placed photographers. Yamaha’s all new R1 and its whizzed up carbon bodyworked R1M sister will be another big draw. Again drawing inspiration from the track, the 200 bhp superbike includes circuit tested quickshifter transmission, 6-axis Inertial Measurement Unit to control traction, front wheel lift traction and the ABS. It’s a lightweight only in the sense that, fully tanked and oiled, it weighs in at just 199 kg. The price tag is expected to be somewhat weightier at around £16k+. Howsabout this for a grand idea? Knock up the fastest lap on an eight lane Scalextric track and you’ll trouser a rather tidy £1,000* in vouchers to spend on biking gear at Sportsbikeshop. You could also net a monkey – £500* to those born outside earshot of Bow bells – simply by sharing on your social media a pic of you taking on the track and your lap time. What’s it all in aid of? Well aside from a bit of fun, Carole Nash are keen to plug a new deal which will see them promising not just to match but BEAT any bikers car insurance renewal premium 2 https://www.carolenash.com/other-insurance/car. It’s available only to bikers in recognition of the fact that if you’re out there on two wheels you need be more aware of road risks and therefore make a better driver 1. Visit the stand too to learn how you can win £250* off your car insurance daily at Motorcycle Live. The R2 and H2 are clearly not the only bikes set to get pulses racing with the freshest of the whole new season’s offerings on display. Ducati’s seriously revamped Multistrada 1200will be going head-to-head with BMW’s new adventure-sports (or “adventure athlete” as the German manufacturer likes to style it) – the S1000XR. Sight could also be had of KTM’s restyled 1050 Adventure – it hit the Milan catwalk – whilst CCM will be showcasing its all-British GP450 Adventure. Harley-Davidson is also debuting a number of models, including the Street Glide Special, ditto Honda whose line-up should include the new VFR800X crossrunner and forecourt friendly Forza 125, a “high performance” scooter which the Japanese manufacturers claims will eke out 123 mpg. Could they also bring the prototype RC213V-S, a road legal version of the Moto GP machine Marc Marquez rode to championship victory? Ever fancied being photographed with a prize-winning model? Now’s your chance to get a pic as your thighs straddle a highly acclaimed beauty – The Trike Shop’s gorgeous 3 Rod. 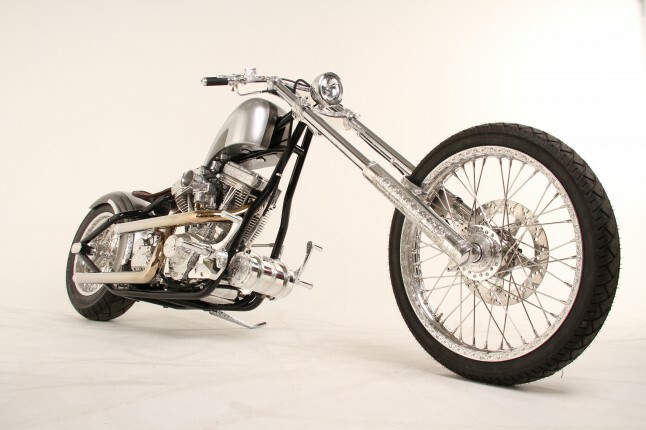 Built using a customised Softail frame with a V-rod engine, this one-off beauty won the Welsh International Custom Show. Currently up for sale it can be yours for a cool £19,995 – or you can sit on it and be snapped totally free on the Carole Nash stand! Not so much cheap as free given that your Motorcycle Live ticket doesn’t just get you in to see all the latest models and browse countless retail stands, but also earns entry to the Crank’d live action Arena. There you’ll see trials, BMX, mountain and road bike riders hurtling off ramps and jumps like there’s no tomorrow. To get a taste of the action click here. ** Motorcycle Live opens on Saturday November 22nd and runs until Sunday November 30th at the Birmingham National Exhibition Centre. Tickets on the door cost £20 for adults, £13 for seniors, £9 for children aged 11-16 with under 10s going free. Bike parking is also free but it’ll cost you a tenner to park a motor. For more information visit www.motorcyclelive.co.uk.